Just a quick update, I tried making the Copenhagen 2nd generation S-train from scratch, how did I do? The download of the Öresund train did not work. Something like "you are not allowed to visit this place" occured instead. Thank you. I can mail you the Öresund train if you want? It works for me on the website. Not needed, Thank you. I tried it again today and know it worked. Maybe there was a problem caused by the "Ö" letter in the filename. BTW: I have added the S-tog SA and SE now. In the SE Zoom2 side view there seems to be a small error: the displays for route code and destination over the doors are mirrored. I have fixed this. An updated progress map. Trying out a different way to run the trains - simulating individual train numbers for increased precision. That takes a lot of time to set up! A look here at the new system with individual train numbers. On the image is Nykøbing Falster station which sees local trains, regional trains, fast trains and EuroCity trains. Most trains terminate here, but some continue to the ferry in Rødby F. Train numbers help manage which trains go where. The EC on this image has just decoupled one IC3 DMU that was added between Copenhagen and Nykøbing for commuters. The other two DMUs will continue on to the ferry at Rødby towards Hamburg. 710R is the local train to Maribo and Nakskov. The simple timetable allows for trains to go to the depot tracks by simply having timed off-duty. R2252 is departing for Copenhagen 17:19 while R2257 arrived at 17:00 and is waiting to turn around and go to the depot tracks (seen starting in the upper left). Maybe the thread should be renamed 'Making Denmark in BAHN'? Anyway, another update. I made a quick and dirty version of the DSB ME locomotive in the original colours. Quick question: Is this supposed to happen? Note the two trains with identical train numbers of route R35. I can see the base route is different, but I am interested in the current route and how two trains of route R35 can have the same train number? Also, is there any way to completely ignore the base route (since I can't change it)? As I understand it, it is only the combination of base route and train number that must be unique. That depends on what you mean by "ignore". Routing and data changes are driven mainly by the current route, and you can query for the table by base or current route. I get the feeling the various tables might be better rendered using standard grid views, which can probably be made to show whatever combination of columns the user wants, but that's a feature request for another thread I think. You can alter the train number and current route code either manually or at data change points. The only restrictions are the limits (number 1..99999) and the unique combination of base route and train number. Any combination of current route and train number is allowed. You can use only one route code, e.g. "DSB", and assign all trains to this as base route. That seems to be possible. However, by my mind it does not make sense at all. Even in this case you may have trains that do not belong to "DSB", e.g. private separate railways (narrow gauge, industrial, mining, ports) or metros/trams/buses/ships, or international services. Thanks for the replies. I think to have a common base route for all trains would make sense while keeping the current routes different. All DSB trains would have base route DSB, since they (at least in theory) could go on any train number. Private rail is not that complicated, so I don't use train numbers there. I'll update with a new progress map next week - most regional trains on Sjælland are running now and mostly on time! Next update after Christmas, enjoy your holidays! Anyway, progress map: Green means all trains are running, orange means some/most are, red means only the track has been laid. Layout is available for anyone interested in having a look. Rather than posting a new progress map I can say that every train (except intercity and other long distance services) is running east of Fredericia - i.e. all the lines you can see on the image. This has one big exception though: Copenhagen S-trains and around Copenhagen Central. As any central station it is a jumble of 100 year's worth of tracks and layout changes. Lots of work there... Next update in maybe a month or so? The line goes underground for a couple of kilometres, but how would you represent it in BAHN? Actually underground or maybe changing the tracks to some of the paved ones? I made the tracks the paved ones for the tunnel between Zealand and Funen. What about subway systems? Hide them underground or put them above ground wherever possible? 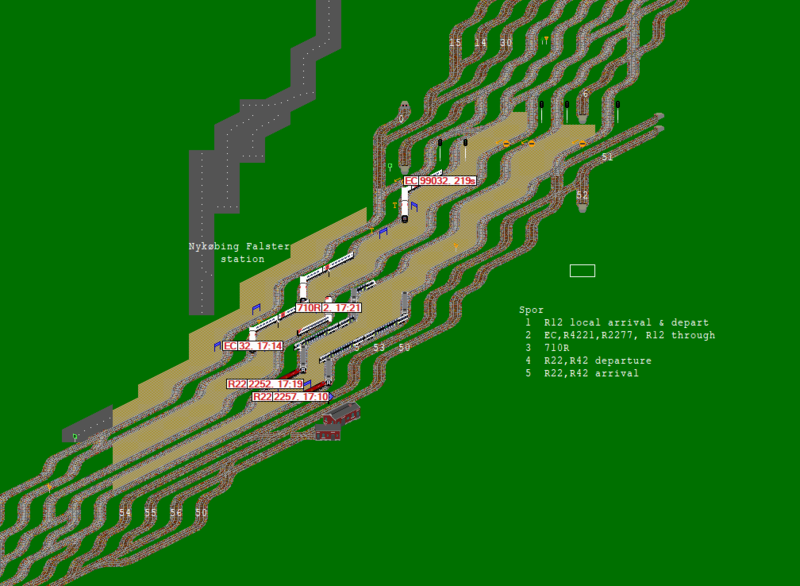 If a track is underground in reality I build it underground in BAHN. Subway systems are hidden underground in my networks for the parts which are underground in reality. Seconded. My current style is to put tunnels, overbridges, underground lines and fiddle yards underground.